I have finished the first Xmas present. These will be for my daughters fiance, Frank, who I absolutely adore. Rnd 1- 8: K2, P2. Rnd 9 & 10: Knit. Rnd 19 & 20: Knit. Yarn: Fearless Fibers Superwash Merino Wool Sock Yarn, 2/24 acrylic for reinforcement thread. Comments: I really enjoyed knitting this stitch pattern. I also am quite pleased with how well the yarn I used for reinforcement thread worked. 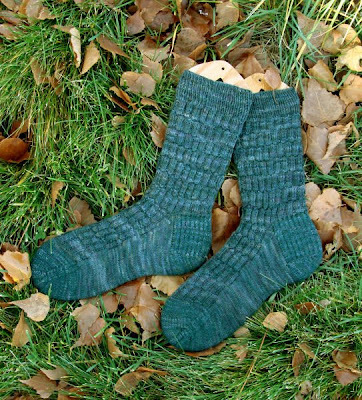 It is a 2/24 acrylic, used on knitting machines (I have tons of the stuff in my knitting room), in a deep green that blended so well you can't even tell I added it to the heels and toes-except they feel a little cushier. Now I have to decide on what the next pair will be. Those are beautiful! Thanks for sharing the pattern. It's simple, but it looks really nice.